July 30, 2015 July 30, 2015 / Adam E.
With the release of Windows 10, we also seen the introduction of the Windows Image and Configuration Designer. The WICD tool is the utility that allows us to create and modify provisioning packages or a provisioned Image build. The goal of this post is to do a high level overview of the deployment methods for provisioning packages. We will review creating some provisioning packages in a later blog and video post, but for now I wanted to focus on the different methods we have for applying our provisioning configurations. The “Offline ” process has two methods for applying the provisioning package to a Windows image file. 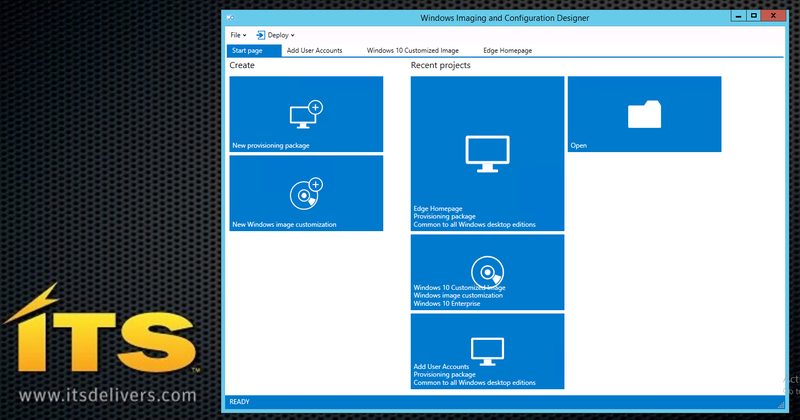 The WICD (Windows Imaging and Configuration Designer) and DISM tools. With this method we can apply our configurations to our offline media. The WICD tools allows you to import a provisioning package directly into a WIM file. This can be accomplished through the GUI or the ICD CLI. With DISM we can use the /Add-ProvisioningPackage switch to add a provisioning package to offline media. The WICD tools allows you to import a WIM and apply the configurations directly into the image file and allows you to create a WIM or bootable media. Those settings are then applied during the different setup passes. With this method, we can pre-build our media with our configurations present. The following table shows how provisioning can be initiated during OOBE phase. Provisioning packages can be applied during the runtime phase. This phase includes: booted into audit mode or OOBE, and when a device loads a desktop. This method allows a user to manually apply a provisioning package to a device. Similar to the way mobile devices are configured. The following table shows when you can install a provisioning package during the runtime phase. In conclusion, Microsoft is giving us a multitude of ways to manage our devices in the new User-Centric environments that we are seeing become more and more prevalent. ← What’s New in Windows 10 Deployment?